For better or worse, I can now be a poster child (ok, woman) for Farm Safety on the Roads. Please, please, please be watchful for slow-moving vehicles. They are not just out on the roads during harvest. We are gearing up for planting season, and there will be many farmers out moving equipment, seeds, and wagons in just a few weeks. Let me tell you my story. It happened the last day of harvest; actually, we had finished the night before. Tall Guy asked me to come help move our equipment home that morning so we could get it all done in one trip. The irony is that they could have moved home that night after finishing, but they all agreed it would be safer to wait until daylight hours for the 20-mile trip home. So off we went to the county just south of us to move home the combine, the tractor and auger wagon, and the bean head for the combine. Grandpa took the tractor and wagon home "the back way," which means he did not take US 41; he stayed on the county roads. The combine, however, is a wide vehicle, and the truck pulling the bean head is quite long, so with TG in the combine and me in the truck pulling the bean head, we turned north on to the four-lane US Highway 41. It was a clear day, just like we had hoped, with very little traffic. When we drive home on US41, it's not a big deal. There are two traffic lanes and an extra "lane' on the right for emergencies. TG always leads, the combine straddling the emergency lane and the first lane, and I always follow. I've learned from doing this about 17 years to give him a healthy distance ahead of me. Combines are so wide, kind of like semis, and the rule is if you cannot see their side mirrors, then the driver cannot see you. Thankfully, I was paying attention to that rule because just about a quarter mile from our road, I was hit from behind by a semi. I had seen him in my side mirror about a mile before our road, and I was waiting for him to go by me so I could make the right turn without having to worry about getting in his way. He saw me, too, but what the driver told me later was he did not realize was how slow I was driving. All my flashers were on, and for good reason. A combine, at least our combine, cannot go much faster than 20 mph. I was driving about 15 mph because ahead of me TG was slowing down to make his turn. The semi driver, who we were told looked down to adjust his heater, didn't see me again until right before impact. He was going all of 60 mph. All of a sudden, my whole truck shook, things popped, and I realized I was not in control of my vehicle. Here are the pictures, taken by my hubby who whipped the combine around and pulled in the median to help. You should know that all he saw from his seat in the combine was a lot of white smoke. 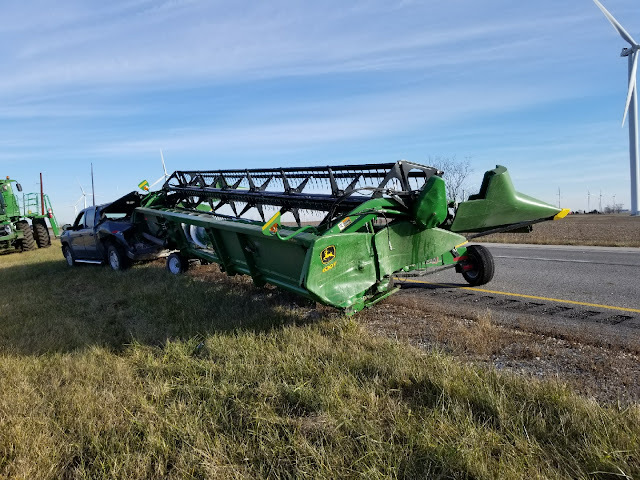 The width of the combine blocked his view from his mirrors. I wasn't close to being pushed into him; that would have been a whole different outcome, but I was pushed closer to him by the impact of the semi's contact from behind. 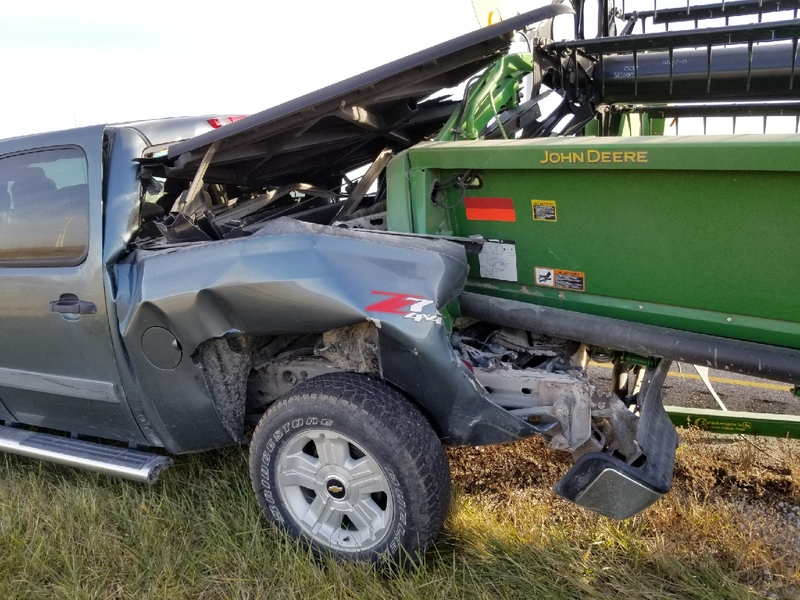 This is our bean head, and the semi hit me smack in the middle, from just right of the deer, John Deere. You can also see I was moved completely to the other side of the road. 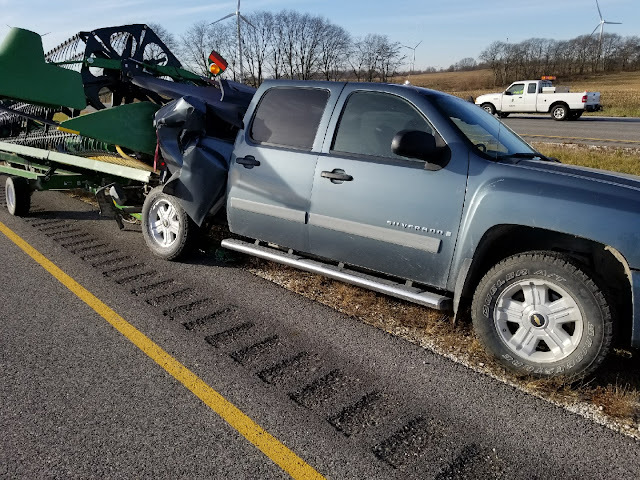 The bed of the truck took most of the impact. It was a short bed. This is an extremely important picture for me. 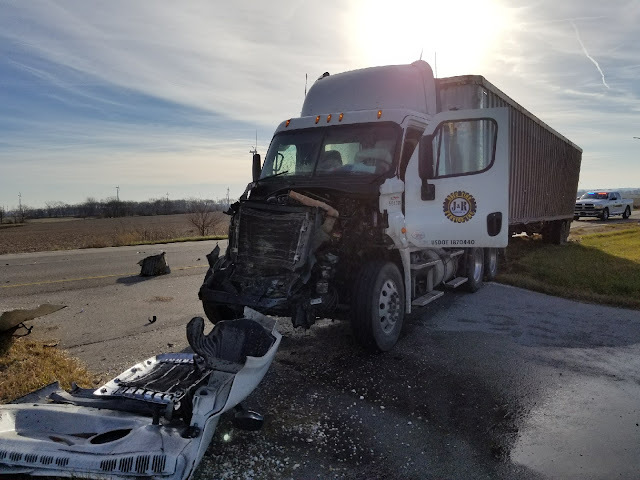 While the bean head was shoved into the bed of the truck, the bed of the truck was shoved up into the back seat of the crew cab. That crew cab was one of the three miracles that saved me from injury. The second miracle is that while the bean head went into the bed of the truck, you can see that the tongue of the trailer went underneath the truck. If it had gone up too, it would have been just like a spear going through the truck. Here is a closer view. I will also say there was an added blessing that no one was in the back seat. This wreck happened on a Monday, so the girls were in school. Anyone who would have been seated in the back would have been severely injured. This is what the backend of the truck looked like after the bean head was removed. We were going to buy this truck from Gpa to be K's first truck, but ....well, you can see that's not happening. 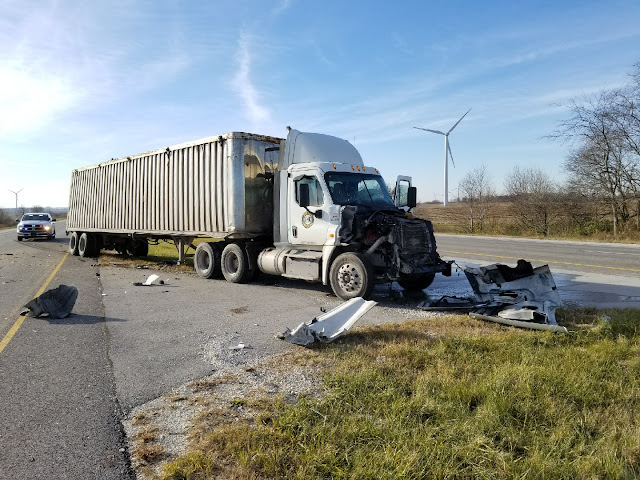 The semi that hit me did not escape. Every vehicle in this accident was totaled. TOTALED! The truck pushed me, and in that instant, the third miracle happened. I did not slam on the break. In fact, I went a ways before I actually realized I still had my foot slightly on the gas pedal. If I had hit the breaks, then I'm sure all the damage behind me would have surrounded me and included me in the mess. 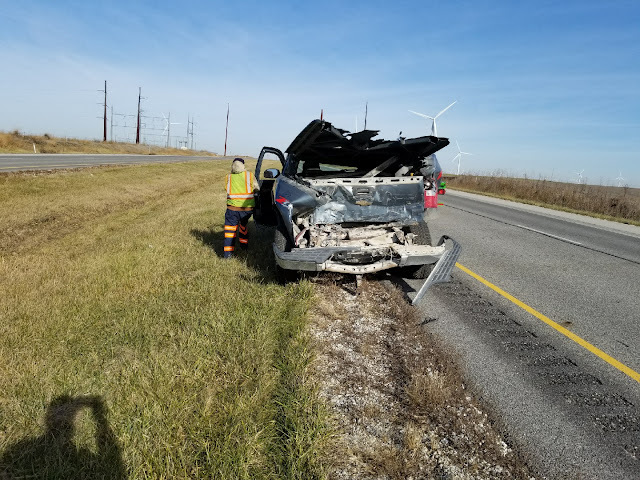 So all vehicles, the semi, the trailer, the bean head, and Gpa's truck were totaled, and I walked away, shakey mind you, without any part of me broken, scraped, or bruised. I felt and do feel so blessed. We believe I had a slight concussion, just from the impact, think a very harsh stop at the end of the rollercoaster ride, and the jarring, while not giving me whiplash, did aggravate my fibromyalgia. Tall Guy told me that my driver's seat could not move, so my arms must have locked up, and pushed my body back into my seat. I seriously got back in our van and drove the girls to a function that night. I wasn't afraid to get back on the road, but I can still see all the skid marks on the highway when we come home from church or are coming home from the southwest side of the state. It keeps my mind focused on safety and the blessings I have in my life. Soooo Peeps..... 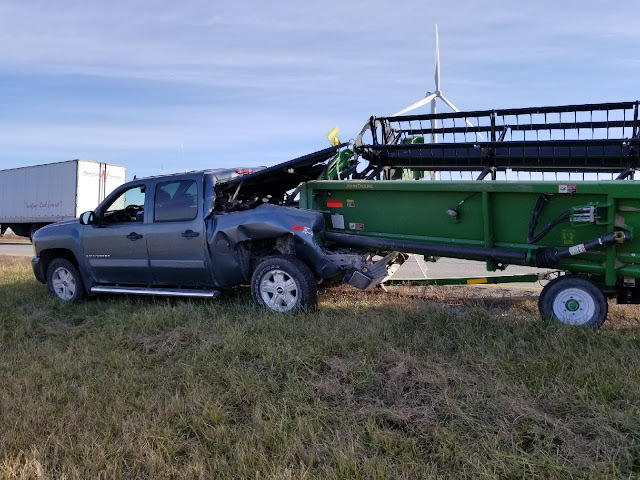 Please please please slow down out there when you come across slow-moving tractors, trucks and other farm vehicles, or any slow-moving vehicle. Finally, I have to admit that I wouldn't look at these pictures on TG's phone for a few days. When I did, it made me face just how lucky I was that day, or just how close I was to not being here to share my story with you.